This year’s big news from Mares is the new FREEDIVING line, designed specifically to greatly improve the performance of freedivers and apneists. A line developed and created using the traditional quality and reliability of Mares, with many new products dedicated specifically to their many apnea enthusiasts. 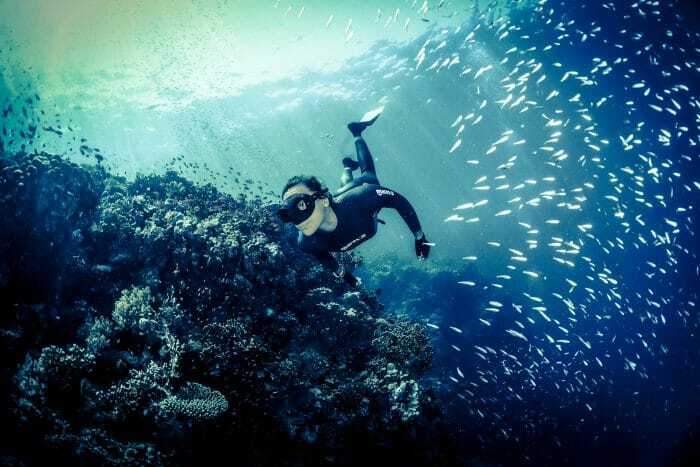 Within the Freediving line, new wetsuits take first place of importance, stemming from a detailed analysis of the needs of freedivers during their dives. For the first time in the Pure Instinct line, there are wetsuits completely dedicated to women, created with special characteristics distinguished by their cut: shaped to fit the female form and aid movement. 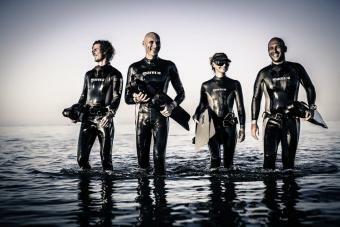 This is very important, highlighting the attention paid to the world of FREEDIVING by Mares. The Apnea Infinity 30 models, available for both men and women, are a one-piece suit with a separate hood and new pre-formed cut: great comfort guaranteed, even in extreme positions requiring maximum arm extension. The Apnea Infinity 30, in fact, provides great freedom of movement due to the new 3mm neoprene, with a smooth outer layer and inner lining. The elastic inner lining and back zip allow for easy donning. The mix of neoprene chosen is highly resistant to compression and also has high thermal qualities. The new production process, allows for the creation of a smooth exterior, increasing elasticity and resistance to abrasion, while reducing friction in the water for better hydrodynamics. Neoprene panels with a high elastic inner lining are present in areas of greater strain, for example the neck, underarm and base of the zip. 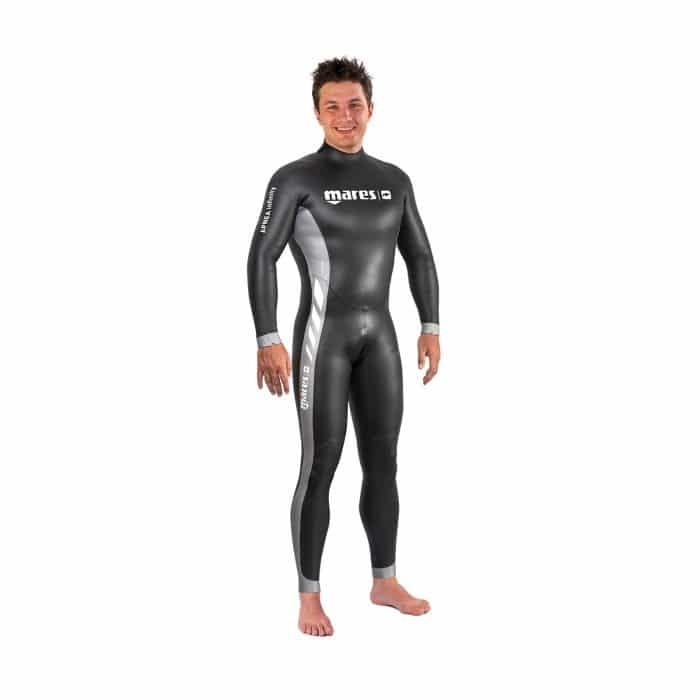 Much attention has also been paid to the aesthetic aspect of the wetsuit, highlighted by grey side stripes from the ankle to the wrist; lending it a ‘fluid’ look that is enhanced during vertical and horizontal movements in apnea. The Apnea Instinct 17 is available in both male and female versions, created with the same innovative neoprene as the Apnea Infinity but with a thickness of 1.7mm. It is a two-piece wetsuit with jacket and high-waist pants, developed with a preformed cut and unique white graphics which make it particularly attractive. The male jacket includes a ‘beaver tail’ closure and double quick-release fastening system. The female version utilizes a single fastening closure system. The Apnea Instinct 17 wetsuit is the ideal solution for competitions in pools and very warm waters. Completing the line of wetsuits dedicated to freediving is the Apnea Instinct 50 model, a 2-piece suit which echoes the preformed cut of the Apnea Instinct 17, but is constructed of 5mm lined black neoprene with an open-cell interior. The mix of neoprene is very elastic and resistant to wear during the most challenging dives. Around the face, wrists, ankles and waist of the pants, the neoprene is 3.5mm in thickness for easy donning. The pants are high-waisted and the closure system on the jacket is in the form of a beaver tail with a double quick-release closure system (single closure for women). In the new FREEDIVING range there are also some special accessories. A nose clip specific for apnea, studied down to the finest of details and now finally available to freedivers all over the world. This small accessory is fundamental for all freediving activity and other varied specialties of this sport. 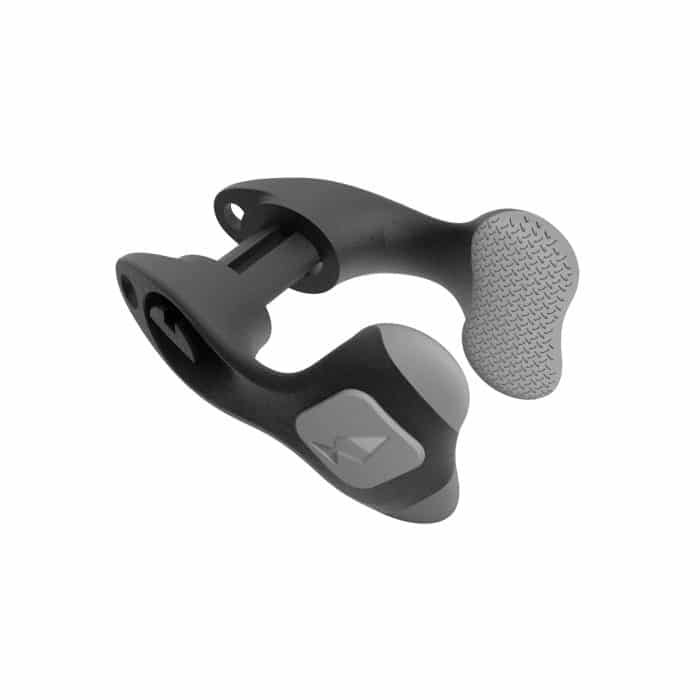 The new shape of the nose clip is highly ergonomic and adapted to use with or without a mask; fundamental for carrying out the correct equalization procedure without the need for hands. Its specific design makes it very compact and light, with a high level of detail in the area of contact with the nostrils. This point of contact has a soft mould for greater comfort and better grip on the nose, as well as guarantees better regulation of pressure on the nostrils due to the symmetry of design. The new nose clip is ideal for apnea in all situations including swimming disciplines. One of the most interesting accessories is represented by the new Apnea Backpack. Mares also wanted to dedicate attention to pre and post dive, where good organization of a kit is fundamental. The Apnea Backpack is designed to allow freedivers to easily pack and transport all of their equipment even when wet, as the bag is watertight. The material used is light and abrasion resistant; the ideal bag for transporting equipment in every situation. The backpack has a large internal volume, 75 liters, which allows for storing long freediving fins including all other necessary pieces of equipment the diver requires. Lastly, the comfortable ergonomic shoulder straps and front pocket for documents make the Apnea Backpack a highly versatile product for all freedivers.